Several days ago, Sunflower Farmers Market asked their Twitter followers to name their favorite no-bake homemade desserts. We don’t eat a lot of traditional dessert in our house – we consider fruit to be dessert and we don’t even eat that every day. If you’re like us but sometimes want a little something extra, I have a couple of no-cook / no-measure dessert suggestions. If you use frozen berries, you may not even need to pop the dish into the freezer – if you drizzle lightly, the berries will probably harden the coconut cream on their own. I’ve also done this with blackberries, but blueberries are my favorite. We make our own coconut milk yogurt, which is a little more labor intensive than just buying it. But if you can tolerate dairy and buy yogurt at the store, this treat is pretty much zero work. Again, it uses the magic of frozen berries to do the work for you. 🙂 No work and no waiting. Put the amount of plain yogurt you want to eat in a dish. 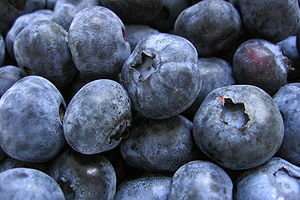 Add frozen blueberries (about 1/2 as much fruit as yogurt) and stir quickly. The frozen berries will freeze the yogurt into a slushy consistency and it will be like eating melty frozen yogurt but so much healthier. No sugar, no additives! (Assuming you start with quality PLAIN yogurt.) We’ve done this with homemade coconut yogurt and homemade goat yogurt (incubated for 24 hours per SCD instructions) and they are both delicious. We are used to tart yogurt so we don’t need to add sweetener. If you haven’t fully weened yourself off sugar yet and want a little more sweetness, drizzle a teaspoon or two (you don’t need a lot) of honey on top and stir it in. This is one of my favorites because it is SO easy and portable. You can even walk into the grocery store, buy the 3 ingredients, grab a spoon, and be eating this by time you get out to the parking lot. You can “make” this one serving at a time or one spoonful at a time. I’ll give you the spoonful directions and you can expand to making it in a small dish or ramekin. Scoop up a small amount of almond butter in a spoon – just enough to fill the bowl of the spoon – you don’t want it heaping. Put 3-5 blueberries on top of the almond butter – however many fit on your spoon. You can use frozen, but I think fresh is best in this case. Drizzle a teensy-tiny amount of honey on top – more like a drop or two. I know that almonds aren’t ~the~ healthiest nut because of their omega-6 oil and phytic acid, but this combo sure is delish. And it’s great when you want something quick because it doesn’t require advance planning or a freezer. I saved this one for last because it’s the most involved. You actually have to do some slicing (with a knife, fork, spoon, chopstick, whatever) and you have to wait 30 minutes for the result. If you leave them in the freezer longer than 30 minutes, the bananas will get too hard to eat easily and they won’t be as fun or delicious. We didn’t like our name for this one as much as the others. Do you have a better suggestion? Some other names we considered are “banana trail mix”, “banana ice cream sandwiches” (and actually use two banana slices to make little sandwiches), and “banana fudge”. What do you think? What are YOUR favorite no-bake (healthy-ish, real food) desserts?